Sen. Susan Collins, R-Maine speaks during a infrastructure investment announcement at transportation headquarters in Washington on Tuesday. WASHINGTON — The Senate voted 50-49 to repeal a rule that shields donors to many nonprofit groups from disclosure to IRS officials. 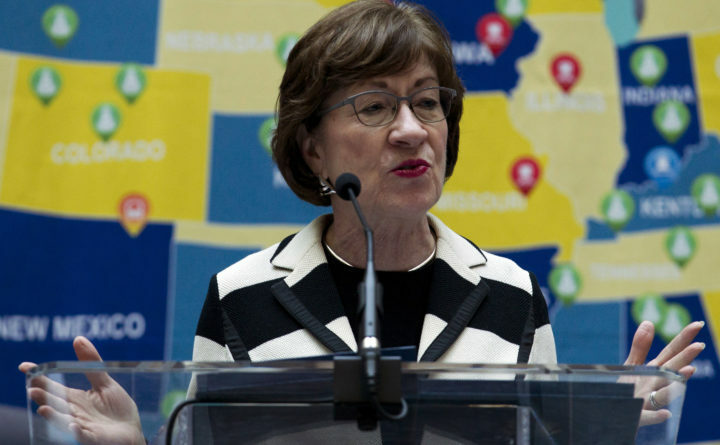 The dramatic vote was tied at 49-49 with 49 Democrats voting in favor and 49 Republicans against, when Sen. Susan Collins, R-Maine, cast the deciding vote to repeal the rule. Sen. Thom Tillis, R-North Carolina, was absent. The resolution by Sens. Jon Tester, D-Montana, and Ron Wyden, D-Oregon, would make use of the Congressional Review Act to repeal IRS guidance that would have allowed nonprofit organizations to omit names of major donors — those giving more than $5,000 — from disclosure statements, though they would still have to keep the information if the tax-collecting agency asked for it. Shortly before Collins broke the 49-49 tie and voted “yes,” Sen. Rob Portman, R-Ohio, was speaking into her right ear, and Tester was speaking into her left. The measure still needs House approval, which Tester has acknowledged is unlikely to come this Congress. The House has 60 legislative days to repeal new rules under the CRA, so depending on how long this lame-duck session goes, a Democratic-controlled House could potentially be able to vote on the issue early next year, though that is unlikely, said Amit Narang, regulatory policy advocate at Public Citizen. CQ-Roll Call writer Kate Ackley contributed to this report.